- Elasticsearch is a search engine. It is powered by Lucene, an open-source full-text search library. It provides a distributed full-text search engine with an HTTP web interface and schema-free JSON documents. 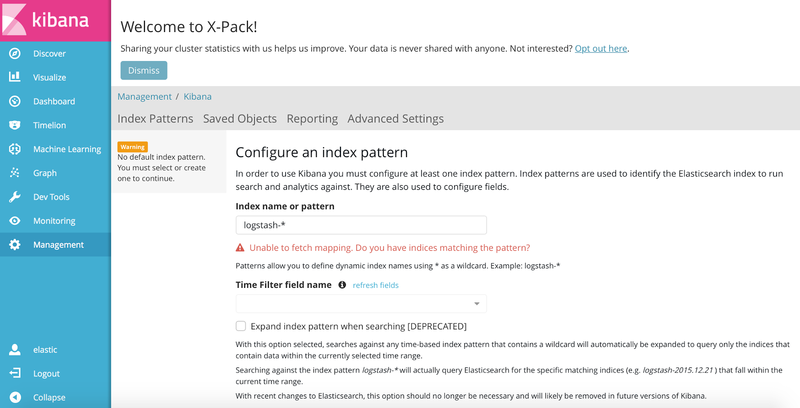 - Kibana is the data visualization plugin for elasticsearch. 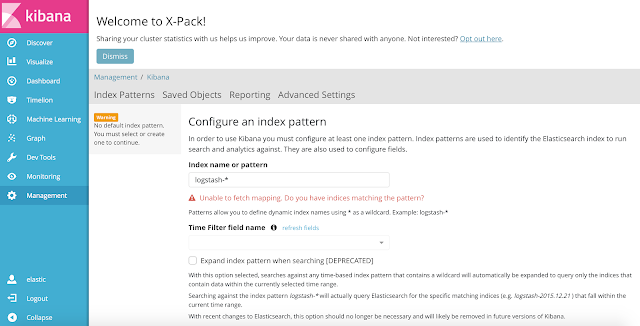 - X-Pack is an Elastic Stack extension that bundles security, alerting, monitoring, reporting, and graph capabilities into one easy-to-install package. 3) Run elasticsearch by typing command bin/elasticsearch from the parent folder. * Elastic is running on the node CkWGb2R which is created by default. Node name can be changed in config/elasticsearch.yml (node.name) before staring the elasticsearch. 4) Open browser and load http://localhost:9200. You can see the following information. - A cluster is a collection of one or more nodes (servers) that together holds entire data and provides federated indexing and search capabilities across all nodes. - A cluster is identified by a unique name which by default is "elasticsearch". - A node is a single server that is part of the cluster, stores your data, and participates in the cluster’s indexing and search capabilities. - A node is identified by a name which by default is a random UUID that is assigned to the node at startup. One can define any node name if do not want the default. 6) Run Kibana in another terminal by typing command bin/kibana from the parent folder. - Go to http://localhost:5601, kibana UI -> Dev Tools -> Console. - Left panel to write query and execution. - Right panel will show the result. Type "GET /" and run. This will fetch the current node and cluster information that we have already seen. - An index is a collection of documents having more or less similar characteristics. For ex, index for product data, index for customer data etc. - And index is identified by a lowercase name which is used to refer to the index when performing indexing, search, update, and delete operations against the documents in it. - A type is a logical category/partition of your index whose semantics is completely up to you. - A type is defined for documents that have a set of common fields. - For example, let’s assume you run a e-commerce platform and store all your data in a single index. In this index, you may define a type for user data, another type for product data, and yet another type for feedback data. - A document is a basic unit of information that can be indexed. - For example, you can have a document for a single customer, another document for a single product, and yet another for a single order. Type the following and RUN. * This will create a document of id 1 of type 'my-type' under index 'my-index'. In order to index a document, we must tell Elasticsearch which type in the index it should go to. * Elasticsearch has fast search responses because, instead of searching the text directly, it searches an index like retrieving pages in a book related to a keyword by scanning the index at the back of a book. You can find the login screen. This comes because of x-pack which gives role based permissions and authentication. * You can find more menu options in left side bar. 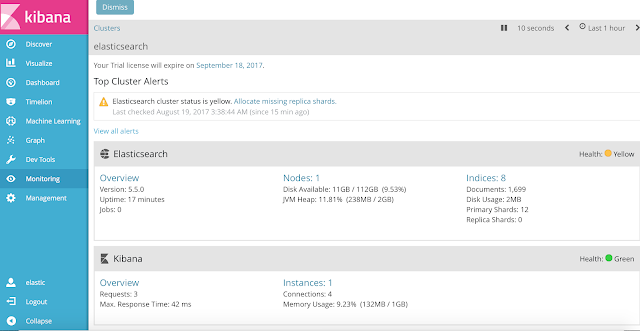 * Click on Monitoring and check elastic search and Kibana nodes.